A French tourist was bitten by a crocodile after posing next to the enormous reptile in a misguided attempt to take a selfie, according to reports. The 41-year-old woman was exploring Thailand’s Khao Yai National Park with her husband when the duo came across the giant female reptile, reported The Mirror. 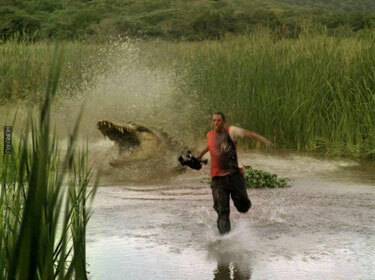 The couple squatted down next to the crocodile, which then reportedly sank its teeth into the woman’s thigh as the picture was taken. 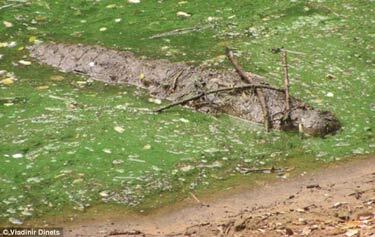 Snaps from the scene show the woman being whisked away by rescuers, as the croc ambles away through the brush. The park reportedly posts many signs telling visitors to stay on paths and not detour through the thicket. The unnamed woman, whose leg appears bandaged, was transported to an area hospital, where she was treated for her injuries. 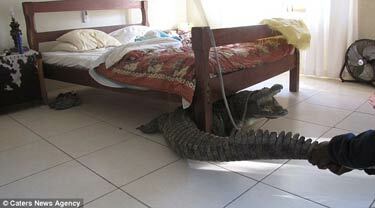 The crocodile remains at large. Has to be Photoshopped, Doesn’t It? Russian title says: “Hazardous Work Operator” and Discovery. A 10 foot water python (Liasis fuscus) was filmed, and made international news, on Sunday at Lake Moondara in Queensland, Australia defeating and then devouring a small three foot crocodile. Mugger crocodile (Crocodylus palustris) equipped with twigs. Charleston Post and Courier reports on a recent University of Tennessee study which finds saurians in both America and India luring birds to their doom. A recently released study – published in Ethology, Ecology and Evolution – is the first to document “lure-baiting” by the species, and one of the few lure-baiting behaviors documented among animals overall. Nah, you say – just dumb luck? Well, the study documented that alligators in Louisiana use the twig trick only during a relatively brief bird nesting season. They have thought this thing through. 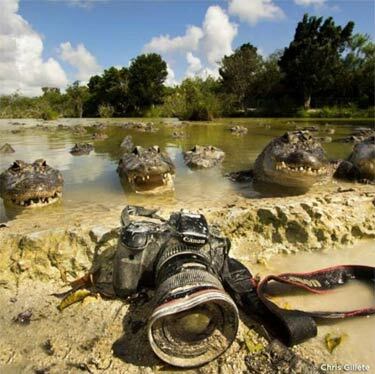 “For people working with alligators it comes as little surprise because we already know how smart they can be. But for the general public it is apparently a bit unexpected,” said Vladimir Dinets, a University of Tennessee psychology researcher, who is the study’s lead author. “They are capable of very unique things when it comes to feeding,” said wildlife biologist Phil Wilkinson of Georgetown, who has spent more than 30 years studying the American alligator. Worse than your dust bunnies. 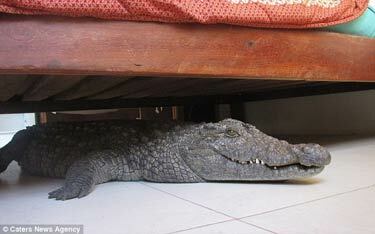 Guy Whittall, age 40, slept peacefully all night, only inches away from the 330 lb. reptile, and never even noticed his presence. Whittall learned that he had had a roommate when he heard the housemaid’s screams while eating his breakfast in the kitchen. An Australian camper was missing and presumed dead after being snatched by a crocodile in front of onlookers as he swam across a river with a friend, police told local media Sunday. The 24-year-old was swimming with a friend on Saturday afternoon near the Mary River Wilderness Retreat, about 80 miles east of Darwin in the country’s Northern Territory. 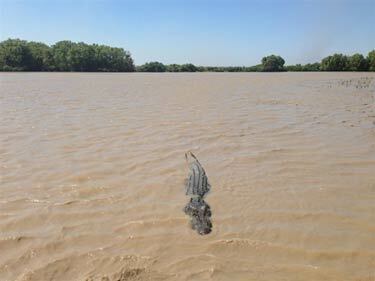 The pair swam to the middle of the muddy river and were on their way back when the crocodile lunged, taking the victim below the surface, news site NT News reported. Saltwater crocodiles, which can grow up to 23 feet long and weigh more than a tonne, are a common feature of Australia’s tropical north, Agence France-Presse (AFP) reported. The local man was celebrating a friend’s 30th birthday at the outback tourist destination, Senior Sergeant Geoff Bahnert told The Associated Press. 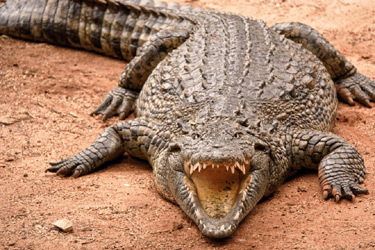 “Several of the group in the party witnessed the male being taken in the jaws of the croc for a period of time, and then he was out of sight,” Bahnert said. 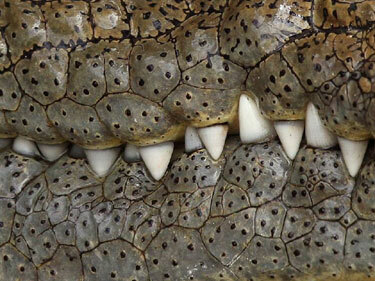 “The Mary River is known worldwide to have the greatest saturation of adult saltwater crocodiles in the world. 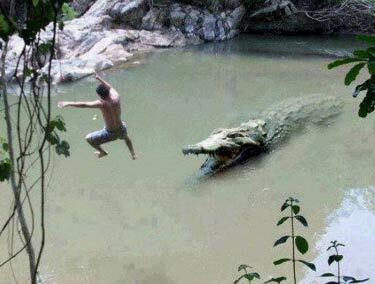 You don’t swim in the Mary River,” he said. Alcohol may have played a part in the decision to swim, he said. 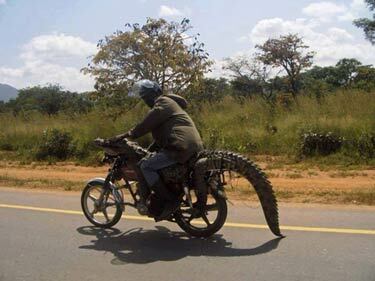 the Archives of Never Yet Melted in the 'Crocodile' Category.